The CableFree HCR is ideal for Long Distance Backbone links for ISPs, Wireless ISPs (WISP), 4G/5G Operator for LTE Backhaul. In this demonstration you can see CableFree HCR Microwave Test Results for operation in the 13GHz Band. Our demonstration shows 944Mbps Full Duplex net throughput using 1024QAM modulation in 60MHz channels. This demonstration shows the clear advantages of a telecom carrier-grade FDD (Frequency Division Duplex) modem radio, which offers dedicated throughput and genuine Full Duplex capacity. Many operators use these links to upgrade from existing 5GHz MIMO radios when the capacity available on 5GHz is saturated, or interference levels too high for reliable operation. 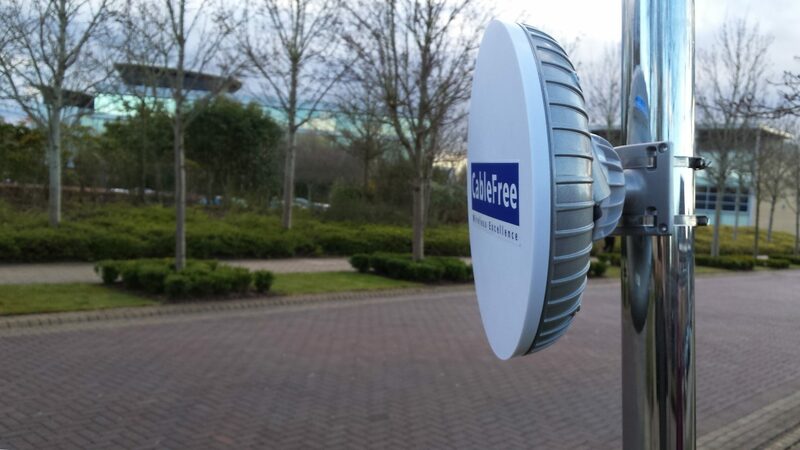 CableFree Microwave Links can be aggregated for higher capacity: A dual-stack (4+0) configuration of this radio in 13GHz would offer 2Gbps Full Duplex net capacity. The CableFree HCR radios were placed in a lab with suitable attenuator material between the waveguides to simulate long distance/range & attenuation. A pair of routers were placed either end of the link, to generate and receive test packet streams. These routers are capable of saturating a 1Gbps link therefore ideal for this test. Due to the nature of Telecom Microwave FDD modems, the same full capacity is available at range where suitable antennas are used. Longer range links require larger antennas to achieve high capacity. Licensed Spectrum ensures that links can operate without interference from other links within a region – the frequencies are allocated centrally by national government regulators. The 13GHz band is normally regulated by national governments for long distance links. Frequency allocations may be narrower than the 60MHz channels shown here. The HCR radio can be configured to operate within whatever channel assignments are offered,with channel widths and centre frequencies set under software control. Typical channel widths for lower frequency bands are 14MHz, 20MHz, 28Mhz, 30MHz, 40MHz, 56MHz. CableFree HCR Microwave platform is a high capacity, modern IP microwave radio link offering up to 1Gbps Full Duplex net throughput for diverse applications including 4G/LTE Backhaul, corporate networks, CCTV, Safe Cities and Wireless ISP backbones. CableFree HCR is a Split Mount Radio for flexibility of deployment, where the IDU can be mounted in an indoor location or optionally a tower-mount enclosure. The ODUs are typically mounted on roof-top or tower location with antenna, with copper coax cable connection to the radio using a single low cost cable. The IDU features multiple copper 1Gbps and SFP optical fibre interface is available for sites where long cable runs or electrical isolation to the radio is required. CableFree HCR is fully shipping and available in all bands listed from 2 to 42GHz.